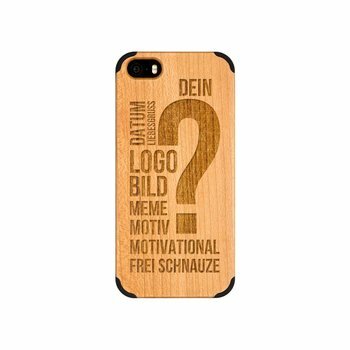 With our modern laser technology, we can engrave your very unique design into the wood of your new iPhone case. No matter whether it's pictures, texts, sketches, or your personal logo. At the end of this page you will find our different wood cases. You can choose between iPhone 5/5s/SE, iPhone 6/6s, iPhone 7 and iPhone 7 Plus. Once you've selected the right model, you can choose between our three different kinds of wood - maple, cherry or walnut. Just put your favorite case in your shopping cart and finish your order. Write down your order number. After processing the order you will receive your unique order number via email. Your order number always starts with "BE". Making our work easier and faster, please always refer to your order number in every correspondence with us. Unleash your creativity. Make sure to use high contrasts. This way our Laser will be grateful and reward you with an true-to-original reproduction of your motif. 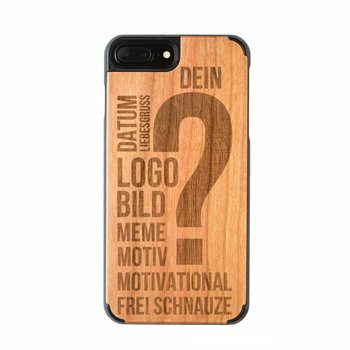 If you need any help with your design, please don't hesitate to contact us at design@kohomi.de - please let us know your order number. Submit your design by email to design@kohomi.de. Providing your logos or image files as vector graphics or jpg files in a very high resolution (300 dpi or higher) helps us achieving the best engraving results. We recommend to scan hand-drawn motifs in black and white and using a scanning resolution of 300 dpi or higher. Before we start the production, you will receive a preview of your design. We won't start producing your case before you confirmed this preview. If you are not satisfied with the design preview - there will be no additional costs for a redesign. We will start the production after you confirmed the design preview and cleared the invoice amount of your order. Your new wooden case will be shiipped after 5-7 working days. You are unsure about the feasibility of your design ideas? We will gladly provide you with a non-binding preview of your layout. 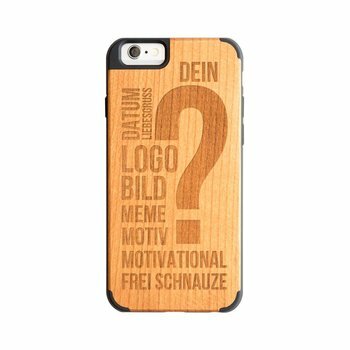 Please send your ideas, pictures, logos, sketches, texts or drawings to design@kohomi.de. We assume that your design does not violate any copyrights or personal rights. For legal reasons we are not allowed to engrave the logo of your favourite team or any other registered trademarks.